Antique tables are available in a wide variety of styles, materials and price ranges. The most common are made from oak or mahogany, but they are also available in other kinds of wood as well. Less common materials include stone or glass. There are tremendous subtleties in styles between periods, but as a rule of thumb, tables from before 1700 are usually massive and include heavy carving. Tables from the 18th and early 19th century are slender and elegant with relatively limited use of carving except to shape the curving legs. Victorian tables are much more like pre-1700 pieces, and 20th century pieces are more architectural in shape. Many antique dining tables have the same convenient features as in contemporary furniture. As far back as the mid 1600s, furniture makers built drop leaf and tilt top tables as well as those that had leaves that could be added or removed as needed. Most of these tables have movable, gate or swing-type legs. Before the 1650s, dining tables were commonly made of a single solid piece of wood over fixed legs. Some larger tables were constructed of multiple pieces of wood solidly joined together. These tables, sometimes called stretcher or refectory tables, usually have elaborately carved legs. They are among the most expensive antique tables with prices usually starting in five figures. Most antique dining tables were made of oak or mahogany with brass for any movable parts, such as hinges. However, you can also find walnut, rosewood, or pine. While although many 18th and early 19th century antique dining tables available today were built by artisans for the upper classes, you can also find farm tables from the same periods. These are more likely to be made from more common woods such as elm, sycamore, or pine and are much simpler in design and form. Dents or scratches that would be serious flaws in other pieces are much more acceptable in farm furniture, though it should still show signs of care and polishing. The older the antique dining table, the more expensive it is. Georgian and Queen Anne pieces usually start around $10,000, with prices increasing based on quality, materials and the maker's name. Farm tables of any period and Victorian pieces start around $3,000. Many of these smaller tables were painted, inlaid, or otherwise given more details than dining tables. Tea tables, for example, which became popular in the 1700s when tea was a new and fashionable beverage in England, were often painted with Chinese-inspired designs to add to the then very exotic experience. Card tables featured drawers which were sometimes made of a contrasting wood or an inlay. A popular Russian style of the 18th and 19th centuries was a stone (usually malachite) top on a wooden table. These smaller tables offer a more affordable way to bring antique furniture into your home. They are also an option for those in small spaces that don't allow for a large dining table. An antique table with an antique lamp on it can add immediate period grace to a room. Antique wooden tables, regardless of period, should have a warm, rich veneer that comes from frequent polishing and use. There shouldn't be too many dents or scratches, but signs of wear are a testament to a table's long life rather than flaws. Be aware that many tables sold as antique tables are made from antique wood, such as panels or floorboards, but are not genuine antiques. Look for unusual wear patterns or for marks of previous work such as nail holes. As with antique chairs, most antique tables available today are from the 1650s or later. Pieces from the 17th century until the Victorian period are typically the most expensive, largely because fine furniture was a luxury for the upper classes during those times and is rarer. During the Victorian period manufacturers produced much more furniture. This was due to both a rise of the middle class and new mass manufacturing techniques that allowed items to be machine made inexpensively. You can usually find antique tables at local antique stores and malls. However, if you can't find what you are looking for there are hundreds of websites that carry antique tables of all kinds. You will usually have to pay shipping and this can be extremely expensive so keep that in mind when you are shopping. Alhambra carries a variety of antique European tables. 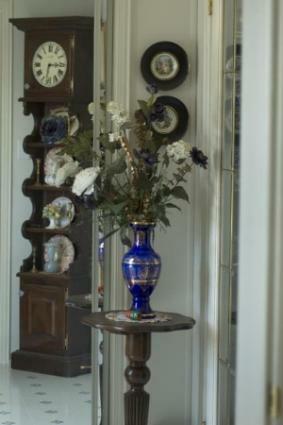 Nicole Madison carries a variety of mahogany antique tables. Antique Tables has a large variety of all types of vintage tables. Old Plank specializes in wooden tables. Antique tables are meant to be used. While you should protect the tabletop as much as possible by using trivets and pads there is no reason why you can't enjoy a family dinner at your table. Keep the piece out of direct sunlight and dust it often with a soft cloth. About once a month you will want to rub in some lemon oil to keep the moisture in the wood. This will help preserve it for a lifetime. Antique dining tables, side tables, and game tables are beautiful and with some care they will add beauty to your home forever.